Police Report filed on 16 June 2005 , 2246 Hrs. 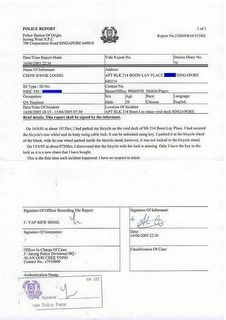 An official Police Report was filed on 16 June 2246 hrs. The police Force will investigate the matter and classified as a theft case. They will get back to me in a few days. Thank you all for your concern with the sms, phone calls and emails.